26-27th Employer Brand International hosted the 3rd edition of the World Employer Branding day. After Budapest last year, Prague was back on the agenda after having hosted the first edition. 450 employer brand leaders from over 42 countries came together to share their best practices on hr communications, employer branding & strategy. 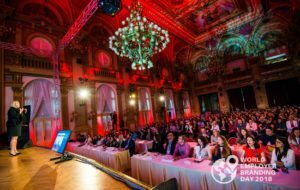 After doing the closing keynote in Prague 2 years ago, hosting it in Budapest, we returned to the stage to host this amazing venue once more. We laughed, jumped, screamed and learned so much about the speakers, their brands and their best practices. From Google, Linkedin to Adidas and Salesforce. Proud to have partnered up again with Employer Brand International and having received so many positive comments afterwards. Looking forward to next year, more leaders, more countries and on a new and just as beautiful location as Prague. Looking for a keynote speaker, host, facilitator or content management partner for your strategy days or conference, let us know and get in touch with Natalie.